The source for this project is located in my GitHub repository. Unit testing is a critical skill in software development. Visual Studio has great support for unit testing in the Node.js plugin. We will be using Mocha for running tests. 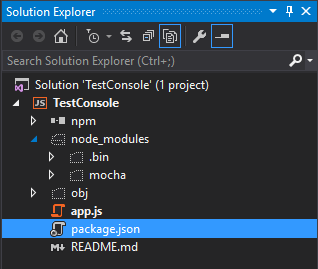 You need to create a default console Node.js application as described in my previous post Setup Visual Studio for Node.js. 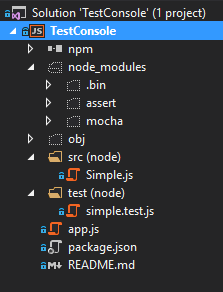 You’ll see the Mocha module on the node_modules folder. Running the test task will fail because there are no test. Add the following code to the file. The code should be easy to understand. &gt; cmd.exe /c npm run test &gt; TestConsole@0.0.0 test C:\Projects\TestConsole\TestConsole &gt; mocha --recursive Simple Tests Constructor Test √ Object is created √ Has some text Famous Names √ Has three 3 passing (6ms) Process terminated with code 0. Process terminated with code 0. Watching your code and running tests. Mocha has a great function to automatically run your tests when any of your files change. In C# there’s a tool named NCrunch which does the same thing. This gives everything you need to do unit testing Node.js in Visual Studio. I hope you’ve found it useful. Please contact me if you have any questions. I love to talk software.